The Scottish Rite of Freemasonry is an order in one of the largest and most historic fraternal organizations in the world, and is represented in the Northeast by the Northern Masonic Jurisdiction. 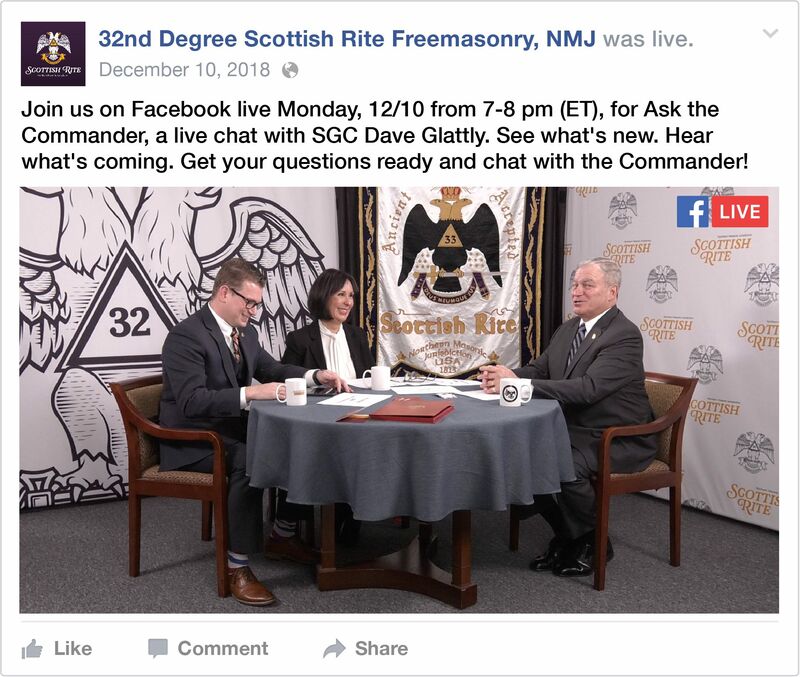 As part of the organization’s initiative to reach out and foster connections with Masons around the jurisdiction, the Supreme Council is expanding their video production and social media presence. 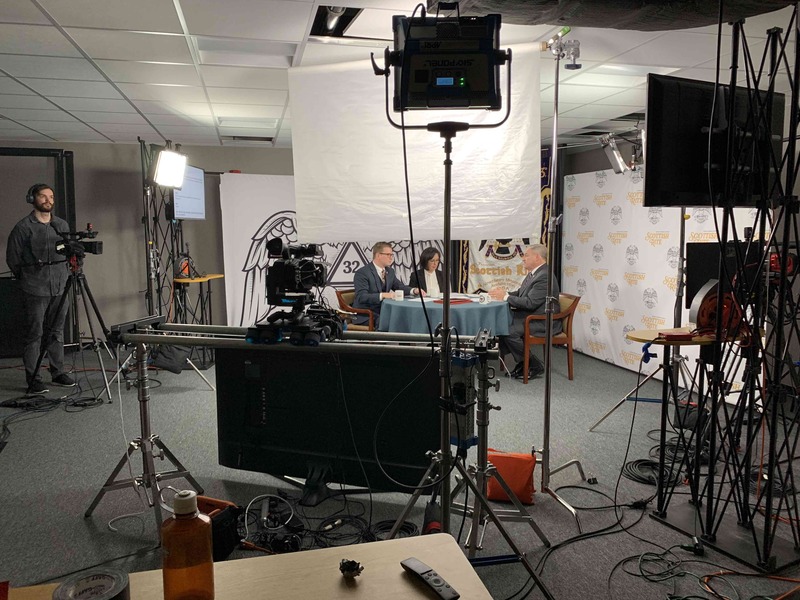 Sonic Pixel Media was excited to collaborate with the organization to webcast an interactive forum with their Grand Commander, discussing their recent accomplishments, current initiatives, and future plans. Behind the scenes view from inside the studio. Camera Operators Brian and Alex run the two cameras on tripods, while the center camera drives back and forth on a Dana Dolly. Planning for a live-streamed broadcast means prearranging and testing all the components of the production before showtime. This includes developing a run of show, determining the location of the cameras and lighting, blocking out the talent, checking the video and audio feeds, and testing the venue’s internet connection. A dependable and fast internet connection is vital for a successful web broadcast–that’s how the show gets from the venue to the web! For most streams, we need around 10 Mbps both upload and download, and when we tested at the Supreme Council headquarters, we were pleased to see that their network had a much faster 100Mbps available in each direction. The program was taking place in their new studio space, so we were able to set up our control booth in a dedicated area outside of the studio. Our video setup included a Blackmagic Design ATEM 2 M/E Production Studio switcher, controlled by a Skaarhoj Live Fly, and fed by three Panasonic DVX-200 cameras in the studio (one of which was driving back and fourth on an eMotimo Spectrum ST4), and also a video playback/graphics computer. To capture the talent’s voices, we used three Sanken COS-11D lavalier microphones, a broadcast standard, which our audio engineer monitored and mixed using a Behringer X32 Digital Console. The final program feed was then sent to Livestream and Facebook via dual vMix encoder PCs. The day of the event is when all the magic comes together. Our crew of seven arrived five hours before the show to build the cameras, set up the lights, and connect to the internet. At three hours before show time, we ran a rehearsal with the talent and all of the technical components, ensuring that the camera shots were perfect, the mics sounded great, and the broadcast could successfully stream online with no issues. Once the client and the director were happy with the rehearsal, everyone broke for dinner and final preparation for the show. During the webcast, every crew member plays a key role to ensure the program is successfully delivered to the online audience. In charge of our team is the director, who chooses which camera shots to show on air at which point and cues the various video roll-ins and on-screen graphics. 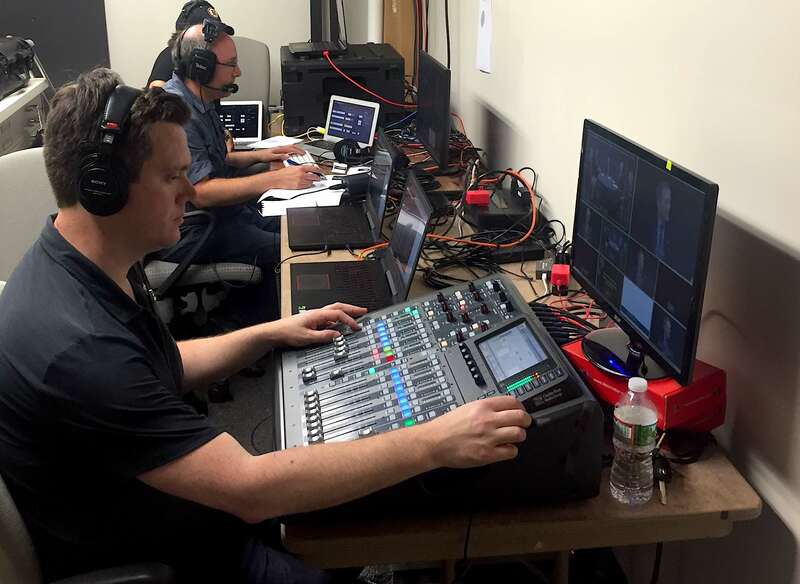 Second in command is the stream engineer, who monitors the webcast at every point of the process to check for quality and solve any problems that may arise during the show. Also in the control room is the audio engineer, who listens to each microphone and adjusts the volume throughout the show, keeping the sound consistent. In the studio across from the talent are the camera operators, who operate the cameras as directed over headset by the director. Through teamwork, attention to detail, and clear communication, the production team helps produce a successful live show. On the control side of the studio space. Audio Engineer Jim mixes the multiple lavaliere and boom mics in the studio, while Director Don switches the camera feeds and Video Engineer Mike monitors the broadcasts and recording. To broadcast the show from the studio to the online audience, we opted to stream over two independent content delivery networks (CDNs): Vimeo/Livestream and Facebook Live. By simulcasting to multiple platforms, we were able to reach additional viewers who may not have otherwise seen the program. Another plus of simulcasting is that if one platform was to experience a service interruption, the other platform could serve as a backup. These two feeds combined reached over two thousand viewers and received hundreds of comments from members around the country. As a live Q&A, viewers were able to ask the Commander questions through Facebook comments and Livestream’s chat feature, and hosts Michael and Linda pulled dozens of questions for answering on-air. This component of interactivity helps increase viewership and production value, taking advantage of the unique benefits of live video versus pre-produced content. Moderator Michael Russell asks the Commander a question from the internet audience. Thanks to all the planning and collaboration between our team and the internal team at the Supreme Council, the “Ask the Commander” webcast was a great success! 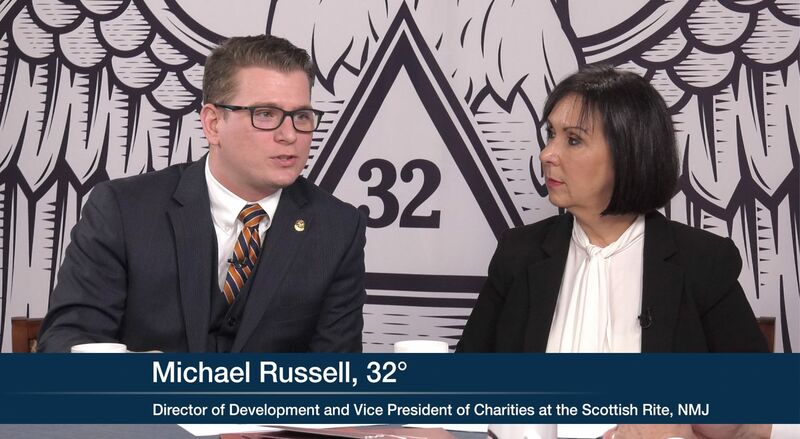 We look forward to helping the Scottish Rite, NMJ produce more live-streamed programming in the future. Interested in learning more about live streaming with Sonic Pixel Media? Contact us here!